All transactions are safe and secure with a reliable history in online purchasing behind each of our associates. 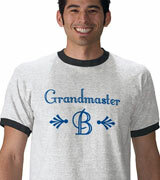 Buy the Grandmaster B t-shirt to own Married with Children clothing and merchandise. Bud Bundy (David Faustino) learned early on that he can't attract women to save his life. His answer to this problem is to reinvent himself. "As of now my story is that I'm a bad boy rapper from the streets of New York. Goodbye Bud Bundy, hello Grandmaster B." While in theory this could work, it doesn't work for poor Bud. Not only is he a bad rapper, but being referred to as Ghostbuster B doesn't help either. Get it with a No Maam shirt for the perfect combo. In addition to the Grandmaster B tee above, browse the Married with Children Clothing Gallery for more apparel like men's and women's clothes, kids shirts or hoodies.